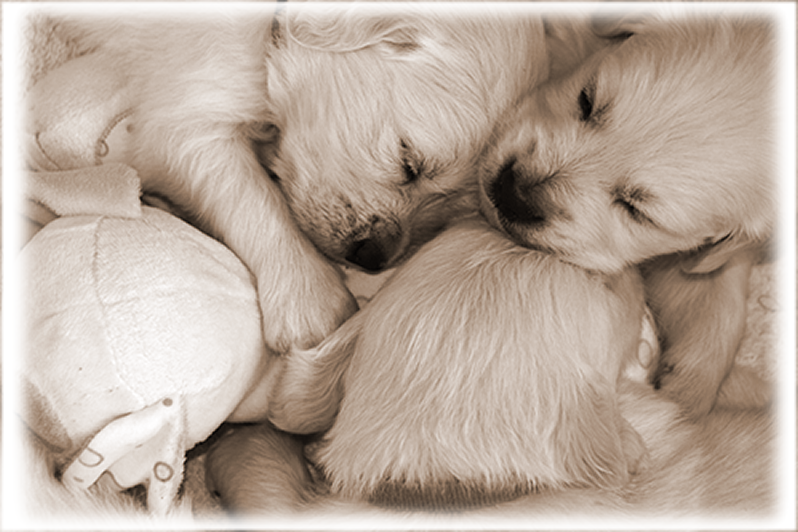 Our goal is to breed and raise exceptional quality British Style Golden Retrievers. Our bloodlines are from only the most respected kennels worldwide. We are members of the Canadian Kennel Club, UK Kennel Club and GRCC and strictly adhere to their code of ethics. Our breeding dogs have passed all health clearances for eyes, heart, hips and elbows. We can't wait for what new adventures await us! Whenever the gang anticipates that it’s time to go outside, they’re ready to rumble! Like a bull released from its pen at the rodeo, the little puppies spilled out onto the living room floor, just steps away from the door leading to the yard. There’s no time to lose. The weather was great and there was so much to do….so many new adventures, so many games to be played. After the big squeeze through the little opening, they were outside and scattered in many different directions. Some headed straight for the rock garden while others tore across the lawn at top speed. Mom was her playful self and engaged all the pups in various forms of play while keeping them topped up with liquid refreshments. This bunch always leaves the whelping box looking like a well-worn dorm room. The towels are askew, the water bowl has been inverted and there are toys everywhere. At the end of playtime, they all pile atop one another like dominos, some right side up and some upside down, but all content and dreaming of their next adventures to come. As our time with the puppies draws to a close, we reflect on the time we’ve spent with them. They’ve come from tiny little bundles that we held in our hands to happy, energetic mini-dogs with a zest for fun and love. We have mixed feelings about seeing them go, but we find our greatest comfort in knowing how much happiness they will bring to their new families. We will treasure the memories and the kisses always. So long, little ones. We wish you all the best in your journey, but most of all, we wish you love. That concludes this edition of “Puppy Tales”. See you next litter! Actually….it was a plane. We don’t get many planes flying overhead, but on this occasion the mini-pack was out for one of their many outdoor romps. As the plane’s engines shattered the quiet of the country, all puppy activity in the yard ceased immediately as if time stood still. Six furry little heads were locked in the “up” position looking skyward. Once the noise subsided, it was business as usual. Business in the yard consisted of a variety of activities and there was lots of it since the weather has been glorious. Throughout the week, as the puppies’ confidence grew, and they became a bit more independent, it now takes little coaxing to get them out of the whelping box and take the three or four bold steps to go outside. Once that challenge was overcome, they embarked on long range expeditions to remote corners of the yard. There was some rock climbing, chewing on sticks or blades of grass and sprints that typically culminated in a tumble. One perpetrator who shall remain unnamed, even contemplated an ill-conceived escape attempt, but for certain – everyone had fun. Of course, mom was always nearby and ever the star attraction as she made her rounds with the milk wagon. Meanwhile in the whelping box, apart from head butting and tail biting, one of their new favourite pastimes is to work out how to invert the spill-proof water bowl. As things start to wind down, the little ones still love to pile atop one another at naptime like overlapping dominos. When the water bowl has remained undisturbed, some of the girls like to dip their front feet into it and go to sleep that way. That must be a foreshadowing of future spa treatments. That’s it for now but be sure to join us next week for another regal installment of “Puppy Tales”. We love our adventures outside! The dynamic in the whelping box is changing. This is the beginning of the most influential socialization period for the puppies. They’re learning to communicate with each other and with us by wagging their tails. With the increased control over their facial muscles, they are making expressions and are beginning to reveal their personalities and communicate their opinions. They’re craving a lot of attention and affection which, of course is not hard to provide. Mostly, the little ones are getting better acquainted with their littermates. Playtime happens at all hours of the day. And it doesn’t matter if a potential playmate is awake or asleep. One such example was Miss Licorice gnawing on Miss Truffle’s tail as she lay there sleeping. As she was unable to achieve the desired result, Miss Licorice moved on to her next victim. Since the little ones are getting more accustomed to eating solid food, they are drinking plenty of water to keep hydrated. Of course, Misty still nurses the puppies to supplement their diet. Another change in the pups’ habitat was the addition of shredded paper to the whelping box extension which is their first step toward house training. The gang has now had the opportunity to embrace the great outdoors and explore the vastness of the yard. Admittedly they got off to a slow start because walking on grass versus cotton is a whole other dimension. Once they overcame that, each took off to explore various areas or wrestled with a sibling, but when mom came around, there was a free-for-all trying to jockey for position at the milk bar. On one occasion they appeared startled when Misty inexplicably rolled around on her back for awhile and then got up to run laps by herself at top speed. If this happens to any of the pups, we’ll know where they learned the “wild dog maneuver”. That’s it for now but be sure to join us next week for another stimulating installment of “Puppy Tales”. Misty and her brood have been relocated into the living room which is a pretty regal deal for mom. She’s got both a sofa and a love seat to stretch out on, not to mention some carpeting and some sections of cool wood flooring for lounging. There’s also a walkout to the backyard for those peaceful Zen moments, washroom breaks or for monitoring the activities of our resident wild turkeys. Unlike many other moms in this situation, Misty didn’t bat an eye. She knew a good deal when she saw one. To aid in the puppies’ campaign to bulk up, they were introduced to gruel: a healthy concoction of large flake oatmeal, yoghurt, honey, goat’s milk, vitamins, raw meat and vegetables (all organic) to supplement the feedings they get from their mom. With their inaugural bowl, no one needed a second invitation. Despite being semi-retired, Misty continues to keep the milk bar open 24/7 for top-ups but we’re certain that she relishes the break she gets from each puppy’s twenty-eight razor sharp teeth! This week we removed the pig rails and added an extension to the whelping box which has doubled its size. Now that the puppies are growing, they need a bit more space to allow them to pick up speed to scramble from end to end. One end now features sleeping quarters and the other end which has been filled with paper shredding serves as their lavatory. In addition, the puppies now have gym memberships, an elaborate play station and numerous plush toys at their disposal. The little ones are developing their strength, co-ordination and cognitive skills as well as learning how to engage in an activity with a littermate, even if it’s just bumping heads. Since their hunting and chasing instincts are emerging, they practice with their plush toys but the most fun they’re having is the increased interaction with their littermates. And nobody cares if their sibling is awake or asleep. In this playground, anything goes. That’s it for now, but be sure to join us next week for another chilling installment of “Puppy Tales”. It was a typical summer day. A warm breeze blew through the trees rustling the leaves sporadically. Off in the distance the chipmunks were communicating with their trademark chatter. Periodically a tiny indecipherable sound penetrated nature’s soundtrack. Softly at first and then again until the voice became more insistent. This required some investigation on our part. It didn’t take long to locate the source. It appeared that somehow Mr. Jelly Bean had escaped the confines of the whelping box. Without the benefit of a map or GPS, the little tyke managed to traverse a circuitous route into the ensuite bathroom. Needless to say, he was safely airlifted back to the whelping box to reunite with his sisters. Now that their vision is established beyond simply being able to detect light, dark and movement, the puppies are becoming increasingly curious about their surroundings and each other. They are beginning to get acquainted with their littermates and can often be seen standing in a group gently colliding or rubbing their noses and heads against one another whether awake or asleep. In fact, they’re now doing this at various points in time right around the clock. This is the beginning of a key period for the puppies as they are developing rudimentary social skills. They are testing each other’s limits and learning the difference between hard and soft biting and they also take turns sleeping at the top and bottom of the sibling pile. To accommodate the puppies’ rapid growth, we’ve had to raise the pig rails in their box up a notch. These are rails around the inside of the whelping box that are there to help prevent mom from accidentally squishing one of her kids. At some point during the coming week, the rails can safely be removed altogether and an extension to the box will be added which will give the gang lots more room to play in. Despite a very mild bout of mastitis which she’s completely recovered from, Misty continues to be a stellar mom. She may still continually mess up the towels, but she does a great job in keeping her little minions squeaky clean. That’s it for now but be sure to join us next week for another nail-biting instalment of “Puppy Tales”. It’s all about food in this place. Misty continues to have this uncanny ability to advise of mealtime precisely on the hour. Of course, her little flock has followed suit with their love of nourishment as they’ve now tripled their birth weights. Since they’re still in their birthday suits, we’ve not had to loosen their belts, but we have had to make adjustments to their collars. At first glance, it may appear that the puppies spend all their time eating and sleeping, but they do spend a good deal of time exercising. As but as they lay there asleep, they are constantly twitching. These involuntary actions, referred to as “activated sleep”, help strengthen their leg muscles and begin to build muscle mass. This allows them to plod around on all fours when they’re in search of their mom for a snack. Mom adds to this challenge by continually messing up the towels in the whelping box, thereby creating rolling hills that the puppies need to paddle over. But despite her shortcomings in the housekeeping department, Misty’s been a stellar mom. While she spends the bulk of her time caring for the puppies, she does allow for a bit of me-time to have a solo nap on the cool tile floor or to hop up on the bed for some cuddle-time with us. It’s always exciting for us when the puppies’ eyes open at around the 10-day mark. Many of the puppies’ critical organs including their brain are not fully formed and they will spend several weeks developing rapidly. Since the gestation period in dogs is short (63 days), the tradeoff is that puppies are quite helpless at birth. Biologists refer to species that produce immature dependent offspring as altricial, which means “to nurse, to rear or to nourish”. It refers to the need for the young of these species to be fed and taken care of for a long period of time. Puppies are born with their eyelids tightly shut because the eye itself is still developing and is extremely fragile. The closed eyelids serve as a barrier to protect the eyes from potential damage. Now that their eyes are open, it will take a few weeks before their eyes mature and their eyesight begins to approach normal. The puppies are also born functionally deaf since their ear canals are closed. While their ear canals begin to open at around the same time, the ears are much more fully formed than the eyes and their hearing will be quite acute within a week or so. That’s it for now but be sure to join us next week for another riveting installment of “Puppy Tales”. As we headed into the home stretch with Misty’s pregnancy, it was evident that our girl was feeling a tad uncomfortable with that mass of puppies rummaging around in her belly. We situated her on our bed and waited while Misty did laps crawling around the top of it on her belly like a navy seal. Finally, the big moment arrived at 10:20 in the evening in the form of Miss Candy Apple. A scant twenty-two minutes later, Mr. Jelly Bean made his debut. Such a quick follow up gave us false hope because each subsequent puppy took between three quarters of an hour to two hours to materialize. The next was Miss Truffle, followed by Miss Gummi Bear, Miss Licorice and finally, Miss Taffy. One would think that it would get a little easier with each puppy, however Miss Taffy decided to come out feet first. Mom was not impressed and that was despite the bowls of ice cream we’d been giving her throughout. It took her a full day and a half to get the hang of it and of course, now she’s as devoted as any mom we’ve had, wanting to spend virtually every waking moment with her mini-pack. It never ceases to amaze us how the little ones know exactly what to do from the first minute onward and how they instinctively suckle. Apart from nourishment, a mom’s milk contains antibodies vital to the puppies’ survival for the first several weeks of their lives. We weigh the puppies at least twice daily for the first week to ensure that everyone is getting equal access to the milk bar. Misty watches us very closely as each puppy makes a trip to the scale, just to be sure they’re returned safely. At the one-week mark, everyone’s weight has pretty much doubled which is clearly a testament to her abilities as a mom. As a sidebar to the topic of nourishment, Misty still demands her own meals at such precise times to the extent that we were tempted to cover or remove the clock from the bedroom. How on earth does she do that? Puppies are born without sight or hearing and their eyes don’t open until sometime during the second week, so, for now, their senses of smell and touch are what guide them to their target. They use their tiny forelimbs, coupled with great tenacity, to propel themselves around as they seek out their sustenance and warmth. Since their body temperatures will not have been regulated until after week three, the little gang relies on their mother and each other for warmth. Of course, we have a heat lamp at the ready to use whenever mom’s on her break. As we head into the final couple of days, Misty is finally slowing down. This morning she was beginning to nest, which is a sign the big event approaching. Misty knows exactly when it’s mealtime and barks at us if we are not feeding her promptly. She is dining four times a day and races to the kitchen at 7 am, noon, 3 pm and 7 pm. We have set up the whelping box (birthing box) in our bedroom. While most expectant moms attempt to dig a giant hole somewhere in our backyard - usually under one of our spruce trees, we prefer a cleaner, more cozy, sanitary spot. We’re sure Misty will warm up to the idea soon enough! This is Misty’s first litter and if she is like her mom Sierra, she will prefer a dark den-like setting, so we’ve covered the roof of the whelping box with a blanket to make it somewhat like a tent. The above photo from National Geographic gives you an idea of what the puppies look like around this time. The puppies now have fully defined puppy features, however they will continue to develop during the final stages leading up to their birth. We are looking forward to the big event with great excitement and will be praying for a safe and easy delivery of our “surprise litter”! Misty enjoying an evening walk. As we head into the final 10 days of Misty’s pregnancy, we don’t see her slowing down too much. She opts to stay inside enjoying the air conditioning and enjoys our company more than frolicking outside with the rest of the pack. Her waistline measures 31 inches (78 cm) now but she still has a voracious appetite. She is quite happy that we have increased her serving sizes over the past couple of weeks! This weekend she will be introduced to the “whelping box” which is where she will have her puppies. It will be in our bedroom and will stay there till the pups are approximately 3 weeks old. Then it will move to a sunny location in our living room. The living room has French doors to a private yard for pups and mom. Misty has just begun to seek out a special area in the yard to deliver her pups. This is normal behaviour as moms dig a den for their newborns. Obviously, we have a much cozier and cleaner idea in mind. 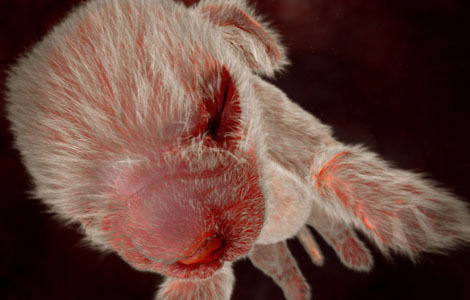 Pre-natal period: It is an interesting fact that a dog's tactile perception develops before birth, therefore unborn puppies can detect touch when the mother is petted from the outside of the abdomen. This establishes the basis for puppies to tolerate being touched when compared to puppies born to mothers that were not petted. Pregnant dogs that are exposed to stressful events tend to release hormones that can be detected by the fetuses which can negatively influence their future development. This underscores the importance of providing pregnant dogs a stress-free and tranquil environment. At this stage, the puppies have a full coat of hair and can be felt moving around in her tummy. Misty sleeps in our room - typically in the middle of the bed. However, as her waistline is expanding she is feeling more uncomfortable and likes to lay on the tile floor in our ensuite bathroom. She demands belly rubs, so it’s easy to detect movement of the little ones. It seems like they are anxious to get out into the world and meet their forever families! Seven weeks ago, they were all chipmunk-size nuggets – all squirmy with little pink feet and noses. They evolved from helpless little bundles to real going concerns that are desperate for backyard time and curious to know what each and every little sight and sound represents. Where has the time gone? The gang loved their outdoor time. And who doesn’t enjoy dining al fresco? Everyone was enthusiastic about helping Chanel survey the perimeter of the fence line, on the lookout for trespassers. On one particular outing, Miss Blaze shot out of the house, catapulted herself over the stoop in hot pursuit of a bird she spotted. It’s remarkable how large a part that genetics plays in their development. Even collecting and chewing sticks is in their DNA. This week, the puppies experienced their first car ride to the friendly veterinarian. Unlike most other litters travelling to the same destination, the ride there was extremely quiet. Once at the clinic, most were on their best behaviour. Miss Ember decided to pass the time by sleeping, while Mr. Torch helped himself to a magazine. Their examinations went very well and their time at the clinic was otherwise uneventful. On the return trip, the group once again succumbed to the rhythm of the road and had to be pried out of their crates to come back inside the house. As our time with this sweet mini-pack draws to a close, we reflect and cherish every moment we’ve spent with them but find comfort in knowing how much happiness they will bring to their new families. They have given us so many kisses and memories that we’ll treasure always. Bella & Hudson's Pups - 3 Weeks old! Regalgoldens © All Rights Reserved 2011. Simple theme. Powered by Blogger.